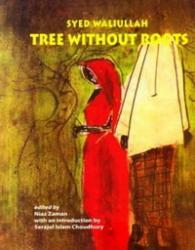 Tree Without Roots is the English translation/transcreation of Syed Waliullah’s classic novel Lal Shalu. With no land or skills to support himself otherwise, Majeed preys upon the simple rural folk by exploiting religion, becoming the self-appointed guardian of a mazar, which he claims is that of a saint. Not satisfied with his first wife, he marries again, this time a woman who is not as amenable as his loving first wife. The portrait of the two women and their relationship to each other and to Majeed balances Waliullah’s portrait of the charlatan. In the English version, now generally believed to be by Syed Waliullah himself Majeed acquires a certain grandeur at the end, returning alone to the maar in the midst of raging flood waters. A picture of rural Bangladesh in the early forties, Tree Without Roots also provides a picture of eternal Bangladesh, subject to the ravages of nature, of storms and floods, of cyclones and dying rivers. Though critical of the exploitation of religion, Syed Waliullah looks sympathetically at Majeed for whom religion means food and shelter. Told in Syed Waliullah’s simple, idiomatic and occasionally lyrical English, Tree Without Roots is imperative reading for anyone interested in knowing the Bengali mind and the impact of religion and superstition on the rural populace.